Keep smartphones secured and protected with the PatrolTek 8037 Smartphone Case from Bianchi. Smartphones are more than just a communication device, they provide critical internet and email access as well as GPS, and as a result need to be protected and kept safe. Designed for versatility, the PatrolTek measure 3.25 by 5.5-inches and fits an iPhone 4s, Blackberry models and many popular cellphone sizes. 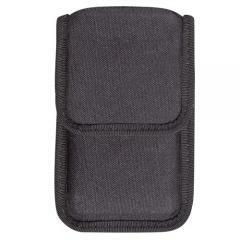 The holder is constructed from weather-resistant nylon to protect contents from the elements and dirt during standard law enforcement activity. The military-grade closure flap secures phones with a hidden snap, guaranteeing contents stay fixed in place regardless of movement. The pouch accommodates duty belts from 1.5 to 2.25-inches wide, attaching with a reinforced rear loop and the Safariland® 744BL belt clip. Great quality, just much too short for most current smartphones. If you have one of the.